Froggie went a-courtin’, and he did stride. With a goofy hat and cape he tied, Uh-huh. Well he strode up to Mister Cat’s door. Took one long look at the mat on the floor, Uh-huh. “Yes, kind sir, I do like orange,” Uh-huh. He twirled around so Cat could see. Said, “Mister Cat, will you marry me?” Uh-huh. “If you dress like that I won’t consent. Even though you gave me this nice present, Uh-huh. Okay, so maybe that’s not quite how it went, but what reasonable explanation could there be for this tableau? 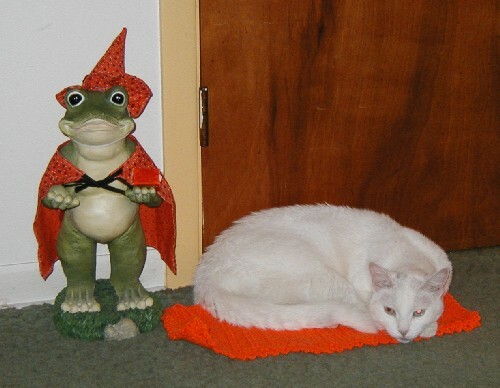 Sure, get a ceramic frog and put it in your living room and dress it up, but this was taken at Thanksgiving and the frog’s outfit is clearly more appropriate for Halloween. But I’m really not one to talk, since I have a stuffed pumpkin living in my family room year-round. And a Grinch doll, wearing his Santa suit, and Snoopy with Easter bunny ears. Maybe I’m more immature than I like to think.